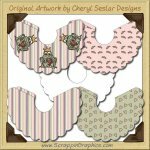 This instant download is perfect to add that special touch of whimsy to your projects. 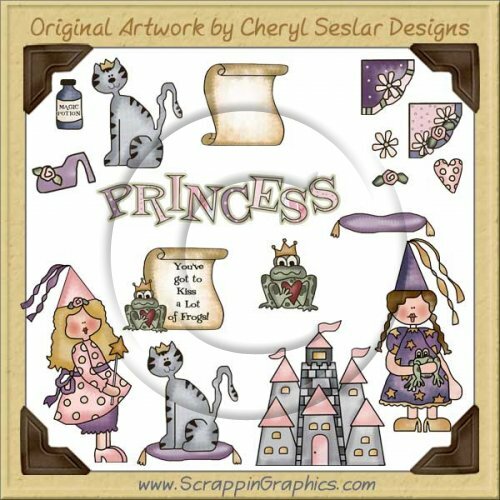 This set includes 59 different graphics: 7 coordinating backgrounds (pink hearts on green, pink text, daisies on purple, roses on pink, purple starts on green, purple pink green stripes, purple pink stripes), 5 frames, princess & castle framed art, 5 lamp shade templates (roses, stripes, hearts, frogs, blank), 2 photo corners, castle, daisy, frog prince, pink heart, kitty, magic potion, 5 word art (OUR LITTLE PRINCESS, COME TO MY PARTY, PRETTY AS A PRINCESS, PRINCESS, YOU'VE GOT TO KISS A LOT OF FROGS), pillow, 3 princesses, pink rose, royal kitty, blank scroll, purple shoe. 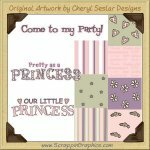 Great for making little girl scrapbook pages, cards, labels, party invitations, party favors and other printables. These large 300 dpi graphics work well for your printing and crafting needs but can easily be reduced in size for use in web designs. The graphics come in high quality JPG and transparent GIF formats. Backgrounds and some frames come in JPG only.